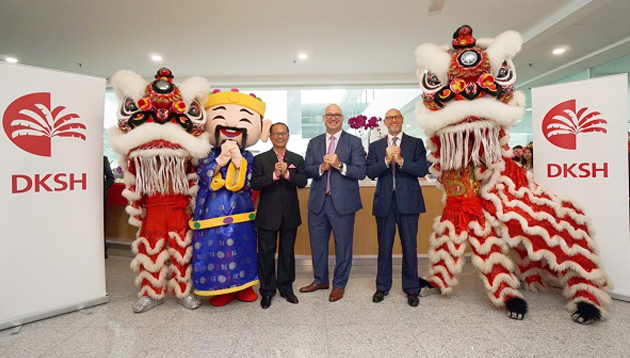 Swiss-based market expansion services provider DKSH has opened its new IT headquarters and Corporate Shared Services Center (CSSC) in Kuala Lumpur. It is now housed at Menara KEN TTDI, after having resided in Teknologi Park Malaysia for 15 years. The inauguration and ribbon-cutting ceremony held yesterday (28 January) saw more than 50 leaders from multi-national technologies including Microsoft and SAP, together with Michael Winzap, the Swiss Ambassador in Malaysia in attendance. Per the press release, the new workplace was built to accommodate the growing needs of today’s employees in many ways, including: a collaborative working space; flexible work arrangements; state-of-the-art technology such as QR code scanning to check meeting room availability; mobile apps; chatbots; and RFID-enabled office access tags. On the new headquarters, Michael Hutab, Chief Information Officer at DKSH, said: “We are excited about this significant upgrade of our IT infrastructure, which enables us to serve our business partners even better and to continuously provide cutting-edge services and setting new industry standards for market information access and comparability. On that day, two SMRT trainee employees, who were checking on a fault on the MRT tracks, were hit by a train near Pasir Ris statio..
What is distracting Singaporeans at work? Unexpected visitors and phone calls are hindering Singaporean professionals from performing their best. How can HR help?.. This growth in employment was generally attributed to the services sector, even as foreign employment grew slightly by 400 in H1 2..
A new inter-agency task force has been set up to conduct a thorough review, and evaluate the current fraud detection system for im..